The 2014 WTA season has been a mixed one for Maria Sharapova, with triumphs followed by failures and vice versa. However, despite a French Open win and successes in Stuttgart and Beijing, the Russian has still not been able to find a recipe for beating the invincible Serena Williams. Next season could become a decisive one, given the American’s age. The year 2014 has brought Maria Sharapova both inspiring victories and bitter disappointments. As usual, the Russian began the season in Melbourne, except that this time she arrived at the Australian Open not after a holiday break but after an injury. Her results were average, but after a five-month hiatus, it was good just to be back in a tournament atmosphere. Straight from the Australian summer, Sharapova flew to the Winter Olympics in Sochi, where she took part in the opening ceremony, worked as a correspondent for the American channel NBC, opened a children’s tennis court and attended some of the competitions as an ordinary sports fan. Having thus missed more than a month of action on the tennis court, Sharapova rushed to catch up with the rest of the tour in California. However, shortage of practice and some teething problems in establishing rapport with her new coach Sven Groeneveld resulted in an early defeat in Indian Wells. Yet by the time she reached the Miami Open in March, Sharapova, with the support of her team, confidently reached the semi-final, only to be beaten by Serena Williams. In April, all that hard work paid off and Sharapova won her first tournament this year: She celebrated her 27th birthday with a 30th career title in Stuttgart. Building on that success, in May, for the first time in her career, Sharapova won the tournament in Madrid, after overcoming top five-ranked rivals Li Na, Agnieszka Radwanska, and Simona Halep in the quarter-finals, semi-finals and final, respectively. However, after the triumph in Paris the Russian was not able to consolidate her success. At Wimbledon, she managed to get only as far as the fourth round, while at the U.S. Open, Sharapova lasted only till the start of the second week before she was dispatched by a ferocious Caroline Wozniacki. 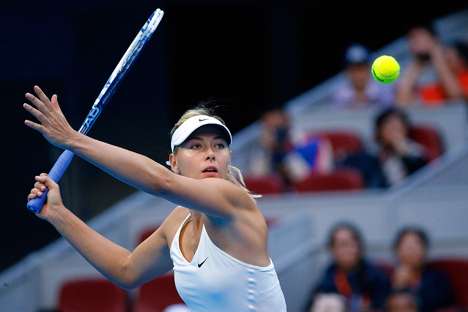 Sharapova began this year’s Asian series of tournaments in China at the first edition of the Wuhan Open, but not very successfully: She lost in the second round to Switzerland’s Timea Bacsinszky, who is not even ranked in the top 50. The Russian responded to the defeat in the best possible way, by winning her first victory in Beijing, picking up her first hard-court title in 18 months. Thanks to that win, Sharapova could claim the season’s top spot, which was to be decided at the WTA finals in Singapore. However, 10 years after her only victory in Singapore, success once more eluded her: She yet again lost the No. 1 title to Serena Williams, who received from trophy from the legendary Billie Jean King. In the opinion of 1992 Olympics bronze medalist and quarterfinalist of three Grand Slam tournaments Andrei Cherkasov, Sharapova has stopped making progress under the new coach. “Maria has had a mixed season: On the one hand, she has won Roland Garros and big tournaments in Madrid, Stuttgart and Beijing. On the other, apart from clay courts, she has practically had no other wins and she has once again been beaten by Serena, that is, in effect, she is just where she was before. The coach of the Russian national women’s tennis team, the winner of eight WTA tournaments and U.S. Open semi-finalist Anna Chakvetadze believes that Sharapova does have it in her to beat Serena. “I think fans and commentators can be satisfied with this season - anybody but Sharapova herself. She expects more from herself and she is really capable of more. To give her credit, after so many years at the top, she is still very motivated,” says Chakvetadze, who believes that competing has become psychologically more difficult for Sharapova than when she was a talented young player full of prospects. But the last word goes to Sharapova herself, who makes it clear that the WTA ranking in 2015 is not an end in itself for her: “My main goal will be a Grand Slam victory, not returning to the top place in the ranking,” she says.